Best Bermuda hotel: The Reefs Club is the perfect place for family vacations. Best Bermuda Hotel? I think it's The Reefs Resort & Club on the south side of the main island (see map below). This beautiful family-owned resort is geographically not far from the Fairmont Southhampton - but a world away in terms of atmosphere. At The Reefs, we couldn't stop staring at the beautiful beach just steps away and loved snorkeling over the coral reefs close teeming with sea-life to shore. 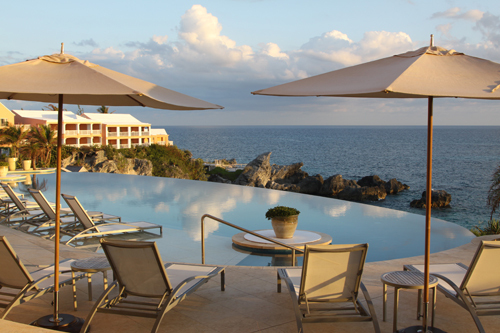 Other reasons I think this is the best Bermuda hotel? Afternoon tea and pre-dinner cocktails served on a cliff top overlooking the turquoise ocean and the dreamy treats in the hotel's Serena Spa. Would you like to have cocktails at the best Bermuda hotel? My husband and I stayed at The Reefs on our second trip to Bermuda. The first time we stayed at a hotel in Hamilton. This meant we had to take taxis to the various beaches and historic sites because there are no rental cars on the island. Because I didn't like feeling like a tourist, it was not a happy time. On our second trip we stay at the best Bermuda hotel, relaxed at the beach, snorkeled every day, kayaked, and took one private taxi tour of the island. Even though the rooms aren't over-the-top luxurious, it was authentic luxury travel at its finest and I loved it. In fact, it was one of the best holidays we've ever had. The staff was great. The food was great. The spa was great. We chose to hang out at the hotel, but other guests at The Reefs enjoyed shopping in Hamilton, playing golf, horseback riding, riding scooters around the island and visiting the UNESCO World Heritage sites in St. George. The best season for traveling to this idyllic island destination is April - October. It's also fun to time your trip to coincide with local holidays celebrations. What you'll find when you arrive is turquoise water lapping up on pink sand beaches, a constant gentle breeze, colorful plant life, and pastel houses with white roofs that make the whole place look like a Gauguin painting. Unlike many islands in the Caribbean, Bermudians enjoy 98% literacy rate and welcome guests with genuinely friendly smiles. 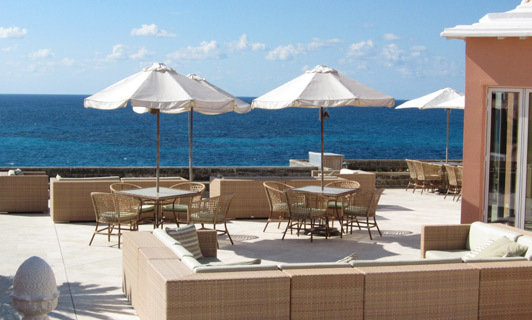 More than 50% of the guests at The Reefs Resort & Club are repeat visitors. Like me, they prefer the authentic "boutique" feel of this property over the impersonal character of a big hotel. Now that I've stayed at The Reefs, I understand why the hotel has won multiple awards from Travel & Leisure and Condé Nast Traveler. If you're planning a 3G (three generation) family vacation, opt for the Reefs Club rather than multiple hotel rooms. Reefs Club quarters are genuinely luxurious and over-the-top spacious. If you tour the island, avoid the Royal Naval Dockyards when a cruise ship is in port. I loved the privacy & the intimacy of the beach at The Reefs. In many ways this hotel feels like a private club. Bermuda (pop. 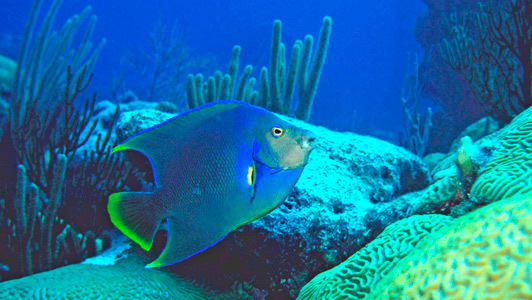 65,000) is located about 500 miles off the Carolina Coast and is a member of the British Commonwealth. As such, soccer, cricket, and afternoon tea are part of daily life (and it's not unusual to see bread pudding on the dessert menu). Michael Douglas, Ross Perot, and Michael Bloomberg have homes here; Oprah flies in for lunch; and Michael Jordan comes to play golf. Need I say more? 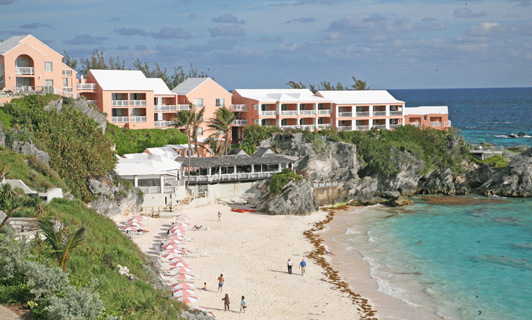 The island is the perfect getaway destination and with its emphasis on personal service and authentic experiences The Reefs is the best Bermuda hotel. For more info, you might want to read "Escape to Paradise" which I wrote for Ranch & Coast, San Diego's luxury lifestyle magazine.